On one of those crystal blue October Saturdays that halts us at the door and reminds us how much we love living in North Carolina, people fill the town square of Shelby, 45 minutes west of Charlotte. Here at Mush, Music and Mutts, North Carolina’s official (but not only) livermush festival, kids romp through bounce houses and queue up to paint miniature pumpkins. A herd of dogs wearing costumes (naturally) parades down the sidewalk, pulling along their humans. When livermush is covered by food or travel networks — more than one national TV host has been to Shelby — it tends to fall into the category of “Southern weird,” like Pepsi with peanuts. But, just like fried green tomatoes, there’s nothing weird about livermush to the people who grew up eating it. Draw a line through Mecklenburg County northwest to Guilford and Rockingham counties. If you grew up west of that line, you know livermush. Mention it to just about anybody in this part of the state, and they nod their heads: “Yep.” It’s as much a staple here as bacon. Enough customers are buying livermush to support not just one, but two manufacturers whose primary product is livermush. Mack’s is one. Jenkins Foods is another, less than a mile away. Between them, they sell 34,000 to 40,000 pounds of livermush every week. 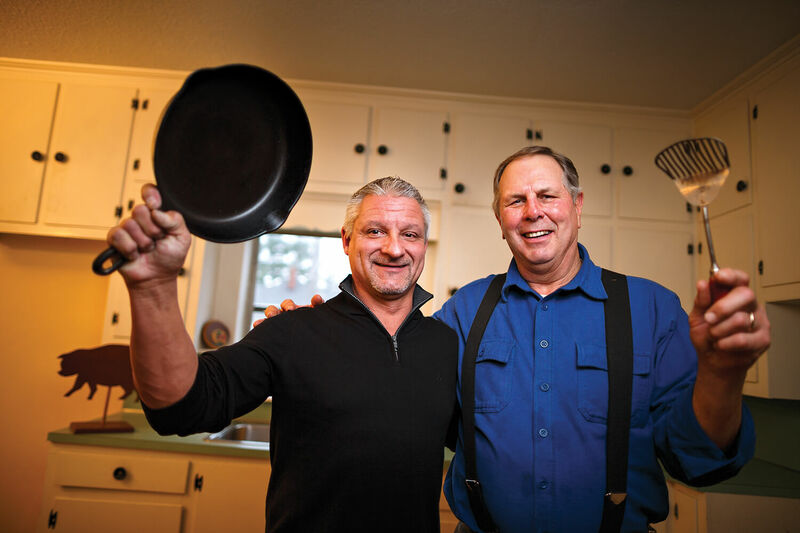 The story of livermush in western North Carolina is one of economic history, cultural history, and even family history; though they’re direct competitors, Ron McKee of Mack’s and Harry Mauney of Jenkins are related. The Great Depression isn’t an era we associate with starting a successful business. We generally think of it as a time when businesses folded. In fact, that’s exactly what happened to B.P. Jenkins before he and a handful of others created a whole new industry in North Carolina. According to his grandson Harry Mauney, B.P. (short for Benjamin Plato) Jenkins ran a general store with his brother outside Shelby. When it folded in the early 1930s — his customers no longer had the money to buy his goods — he began thinking about what he could sell to the stores that remained. Jenkins and his wife had always kept livestock — dairy cows, chickens, and hogs — to feed their family. “The couple was pretty self-sufficient,” Mauney says. Using his family’s recipe, Jenkins started cooking up livermush in bulk in a big cast-iron pot over a wood fire. At first he sold it out of the trunk of his car. So when Mauney says, “Everybody grew up eating it,” he’s not just talking about his grandfather’s generation; he’s talking about everyone in that part of the state, going back 200 years. Make no mistake — heavily seasoned with sage and black pepper, livermush is delicious. It tastes like sausage. The fact that it isn’t universally adored by those who grew up around it seems to have more to do with the texture — which is less like sausage and more like a spread — and a discomfort with consuming organ meat. This issue can sometimes lead to misunderstandings. He must have told her, because she kept letting him make her breakfast. Eventually, Bridges says, her mother tried it and liked it. Livermush isn’t one of those foods only the natives can love. 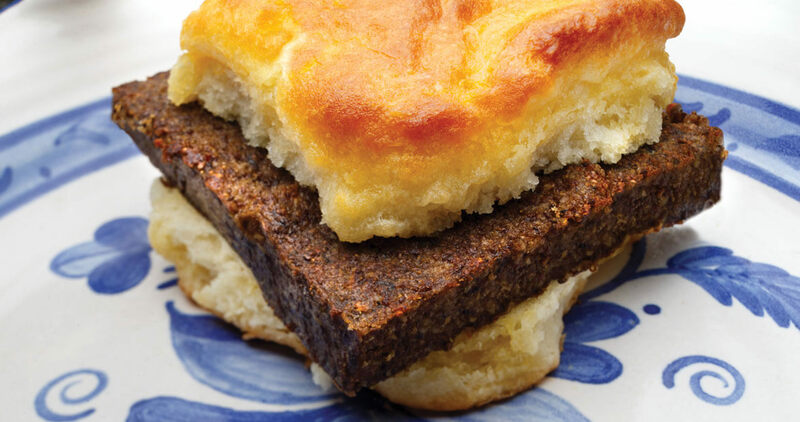 For Clark Barlowe, a native of Lenoir and the chef and owner of Heirloom restaurant in the Mountain Island Lake area of Charlotte, it was all about livermush on a biscuit, with mustard, when he was a kid. Back in 1933, thanks to livermush’s familiarity and its very low cost — about eight times less than bacon — B.P. Jenkins stumbled into a market with a lot of pent-up demand. He wasn’t alone in spotting the opportunity. Chop. Drop. Serve. Eighty years later, the town of Shelby is celebrating what food journalist Andrew Zimmern calls its “micro-regional food tradition.” The line for Mack’s livermush sandwich keeps growing. The aroma of fried pork fills the air; the atmosphere is festive, and nobody’s complaining about paying just a dollar for their favorite lunch.